Access It! Universal.NET introduces a newly designed report designer. The report designer feature is available as an add-on option and may be purchased through an Authorized RS2 Dealer. The following licensing option must be enabled within the Access It! Universal.NET dongle and is a system wide license. The Report Designer form can be broken into four separate areas as outlined below. The toolbox pane contains a collection of static objects. To add a tool to the report designer, simply drag and drop the object from the tools pane to the designer pane. Once added, the object will also be displayed in the explorer pane. The designer pane represents how the objects will be printed on the report itself. Objects can be moved by drag and dropped, or aligned via the alignment options available from the toolbar. The designer also supports a zoom feature allowing for zoom up to 400%. This is particularly useful when needing to adjust an object by a very small amount. The script tab allows for custom vb.net scripting to be applied to the designer and should only be used by advanced users. The explorer pane contains all the database fields currently available to be placed in the designer. In order to generate the database fields, a custom SQL query must be entered by selecting the Edit Data Source link displayed when the report header object is selected in the explorer pane. Once a SQL query has been added, the database fields can be found in the Fields | Bound list. To add a field to the report designer, simply drag and drop the object from the tools pane to the designer pane. When designing a SQL query, a placeholder can be used to substitute values entered when running reports, more information on this below. 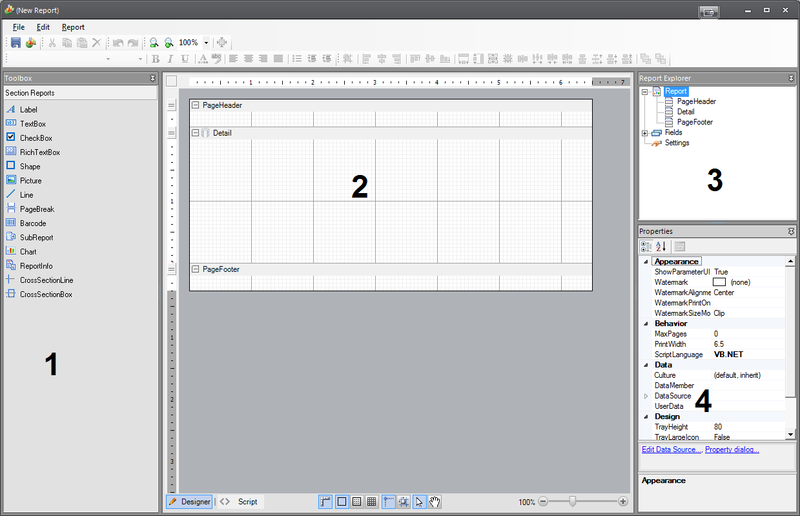 The properties pane allows for control of the properties for the item selected in the designer pane. To adjust overall report properties, such as the SQL data source, the report header object must be selected within the explorer pane. While most properties are self-explanatory, detailed descriptions can be requested from RS2 Technical Support. When running the report, the search criteria prompted is based on the report category. Report categories can be changed from the File | Report |Category list. When designing a custom SQL script, a placeholder can be utilized to substitute the search criteria entered when running the report. This placeholder will also take into account the permission the logged in user has and will not display any unauthorized data. It is recommended a stock report be edited in order to obtain a better understanding of how these placeholders work within the SQL query. When running an Access Level report and specifying search criteria, that information will be placed where the placeholder <%AccessLevelIDsByUser%> is located. When running a Card Group report and specifying search criteria, that information will be placed where the placeholder <%CardGroupIDsByUser%> is located. When running an Cardholder report and specifying search criteria, that information will be placed where the placeholder <%CardholderIDsByUser%> is located. When running an Card report and specifying search criteria, that information will be placed where the placeholder <%CardIDsByUser%> is located. When running an Company report and specifying search criteria, that information will be placed where the placeholder <%CompanyIDsByUser%> is located. When running an Floor Code report and specifying search criteria, that information will be placed where the placeholder <%AccessLevelIDsByUser%> is located. When running an Holiday report and specifying search criteria, that information will be placed where the placeholder <%HolidayIDsByUser%> is located. When running an Input report and specifying search criteria, that information will be placed where the placeholder <%InputIDsByUser%> is located. When running an Interval report and specifying search criteria, that information will be placed where the placeholder <%IntervalIDsByUser%> is located. When running an IP Lockset report and specifying search criteria, that information will be placed where the placeholder <%LocksetIDsByUser%> is located. When running an Macro report and specifying search criteria, that information will be placed where the placeholder <%MacroIDsByUser%> is located. When running an Output report and specifying search criteria, that information will be placed where the placeholder <%OutputIDsByUser%> is located. When running an Reader report and specifying search criteria, that information will be placed where the placeholder <%ReaderIDsByUser%> is located. When running an Recipient report and specifying search criteria, that information will be placed where the placeholder <%RecipientIDsByUser%> is located. When running an Timezone report and specifying search criteria, that information will be placed where the placeholder <%TimezoneIDsByUser%> is located. When running an User Group report and specifying search criteria, that information will be placed where the placeholder <%UserGroupIDsByUser%> is located.